Why has Australia been almost continuously at war? Delivered this International Day of Peace Lecture at St John’s Cathedral Brisbane on 21 September 2017. It is republished from John Menadue’s blog 26 October 2017. 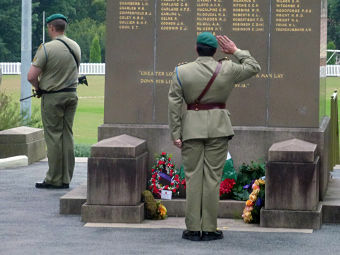 Bermagui ANZAC. Kevin Rheese. flickr cc. In a letter written in August 1855 to his colleague John Bright, the great free trade liberal, Richard Cobden, expressed his hostility to Britain’s involvement in the Crimean War. “And yet I doubt”, he observed, “if there be a more reprehensible human act than to lead a nation into an unnecessary war”. Cobden clearly had in mind wars which could have been avoided and were not the result of an immediate and direct threat to a nation’s territory or interests. 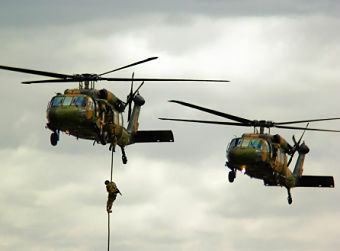 Many of Australia’s wars have been unnecessary wars, or wars of choice, as they are often called. The new federation was born in the midst of one. In 1899, the six colonies had each sent contingents to the conflict in South Africa, and they coalesced into the national army on 1 March 1902, towards the end of a war marked by massive loss of civilian life, and compounded by war crimes. Four times more civilians, mainly children, died in British concentration camps than Australians in Japanese prison camps during the Second World War. And yet, in all the many hours of debate about the war, noone could seriously suggest that the two small landlocked Boer republics were a threat to Australia. But it was a portent that the Australian Army was born overseas fighting in an Imperial war which had no direct relevance to national security. Since the middle of the twentieth century, war for us has become more common than peace. In the 78 years since the outbreak of the Second World War, we have been at war somewhere in the world for 60 years. We have been at war continually since 2001, and there is no end in sight to our involvement in the Middle East. Peter Leahy, Director of the National Security Institute in Canberra and former chief of the Army between 2002 and 2008, has declared on a number of occasions that we are likely to be engaged in conflict with radical Islam for a hundred years in what surely should be termed the tenth crusade. Meanwhile, brewing conflict with Iran and North Korea, with Islamists in the Philippines, and tension with China over the South-China Sea all point to potential future involvement. Australia is more adept at getting into wars than staying out of them. And, once engaged, we have difficulty ending the commitment. Is there any end in sight to our overseas adventures? Surely we have to concede that there is something aberrant about Australia’s history of warfare. By any measure, we are a particularly belligerent country. And we do it all with a clear conscience. It is almost as if we feel we have an international social license to involve ourselves in conflicts, many of them civil wars, at least in part, in countries about which we know little and which present no demonstrable threat to our territory. Most of the world’s small and medium-sized countries do not behave like Australia. They may be involved in conflict close to home, but few of them engage in wars that are far away. In fact, if they did send their troops, their planes, and their ships off on overseas expeditions as often as we do, the world would be an even more chaotic place than at present. Many things need to be taken into account to explain our propensity for wars fought far away. Our institutions present few obstacles to a government bent on war. We have inherited from Britain the tradition that the Crown retains war-making powers. And, in practice, the fateful decision can be made by the Prime Minister, and party discipline ensures that government members acquiesce. There is not even any obligation to allow a debate in the Parliament. In contemporary Australia, oppositions are less likely to provide critical dissent when matters of security are involved than in relation to any other matter of public importance. Australia in Iraq invasion: no consequences for our leaders? Exit Strategy. Paul Hocksenar. flickr cc. The same overall acquiescence is apparent when a war comes to an end. The second Gulf War is a case in point. The overall assessment now is that it was an illegal war, but more to the point, a strategic disaster, the ill consequences of which are still unfolding. Criticism in Britain and the United States has been unrelenting. Bush, and especially Blair, have experienced complete loss of credibility. John Howard, on the other hand, has been subject to almost no criticism at all, and he has expressed neither remorse nor regret for his involvement in the great tragedy visited on the people of Iraq. This points to a general problem. Australian governments can go to war with little to restrain them, and then in retrospect, there is little public assessment of whether the engagement was prudent or productive. There is rarely any introspection about the morality of the nation’s behaviour. We don’t even pursue with any vigour the most pragmatic questions of all – was it worth it, what was achieved, how did the nation benefit? Of all the activities of government, war seems to be the least scrutinized. Do we ever subject it to cost-benefit analysis? Do we count the cost in material and human terms? Why are we involved in so many wars? Our attitude to war is bound up with the cult of the digger, the conviction that the nation was born at Gallipoli, that war has been the defining national experience. These ideas have been inescapable during the cavalcade of commemoration we have experienced since 2014. They are promoted with variety and vigour, and lavishly funded by the Department of Veterans’ Affairs and the War Memorial. 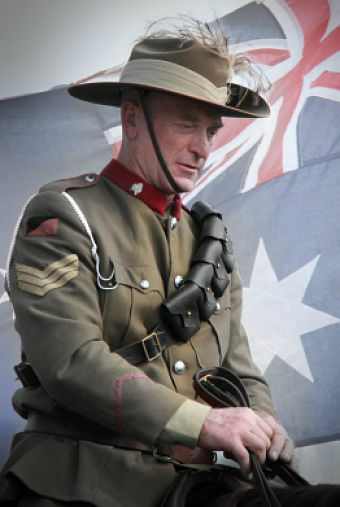 But the strange thing is that, with the intense concentration on war, the focus is entirely on how the Australians fought, not why they fought. There is much talk about tactics, far less about strategy. We like to remember our wars with the politics extracted. With the entire emphasis on individual sacrifice and heroism, questions about the point of the conflict or the morality of our entanglement appear disrespectful and in poor taste. One of the most telling illustrations of our attitude to war came in a press release by Senator David Johnson in September 2013. He had just been installed as Minister for Defence in the new Abbott government. It was his first public statement, and presumably reflected ideas which were current both in the government and in his department. He declared that he wanted the military “to be battle ready for future conflicts in the unstable Middle East and South Asia”. After 14 years of involvement in overseas conflicts from East Timor to Afghanistan, the ADF “had a strong fighting momentum that should not be lost”. He explained that he planned “to maintain and augment our readiness for future fights”. He outlined one of the reasons, explaining that, “operationally, we’re starting to come down in Afghanistan, so we’ve got to maintain some interest for the troops”. ANZAC Sunday CeremonyPROMosman Council. flickr cc. This was quite astonishing. The new minister wanted a new war to maintain the ADF’s fighting momentum. Fourteen years of conflict overseas had not created a desire for peace, but whetted the appetite for further war to maintain some interest for the troops. It wasn’t clear where the new war might be, but most likely somewhere in the Middle East or South Asia. Johnson’s assumptions were breathtaking. Australia, he assumed, had an unquestionable moral right to find a convenient war wherever and whenever it chose. And he clearly believed he would have the government and the community at his back. But it wasn’t the statement alone which was so disturbing. As far as I could tell, it passed without comment. There were no examination of what had been said, no anxious exegesis. No political figure questioned the Minister’s priorities, or his hunger for further conflict. of time to police the earth. Henry Reynolds is an eminent Australian historian who has focused on frontier conflict between Indigenous people and European settlers, and has written many books on that subject. His latest book is Unnecessary Wars (Sydney: NewSouth Publishing, 2016). An astonishingly clear and important article/lecture by historian Henry Reynolds. I will be happy to reference/reproduce this text on my social media. Thank you, Henry Reynolds and John Menadue. I wrote an article in 2003 on how we got into Iraq invasion and pursued it secretly as a commando force in Western Iraq in the first days, without divulging that we had invaded a sovereign country Iraq. We were the first to go in, a day before the Brits and Americans from the south. We went in as an undeclared saboteur force. Amazingly, Australian Outlook of the Australian Institute of International Affairs published my article, perhaps because of my recent background as an ambassador. Its shocking revelations about our undeclared illegal conduct of invasion have been studiously ignored ever since. Australians are good at blotting things out we don’t want to confront.